EVERY BUSINESS NEEDS A PLAN, INCLUDING YOUR FARM BUSINESS BUT . . .
HOW THE HECK DO YOU BUILD IT?! The rewards of operating a small farm or market garden can be wonderful; growing great food for appreciative customers is the best job in the world. BUT, no one has ever said farming is easy. Being a good grower is only part of the answer; you've also got to know how to plan and manage your business, persuade others of the value of your products, maintain financial stability, and stay motivated through your journey to small farm success. Bottom line: Like any business, your small farm business needs to start with a solid foundation. In short, you need a real plan. BUT, who teaches you how to do that stuff? Build a practical, step-by-step plan to close that gap. 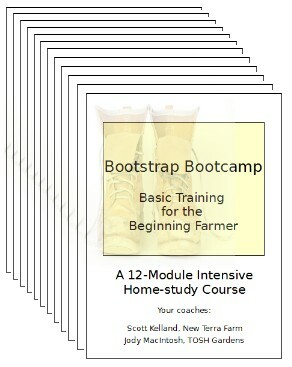 When you 'sign up' for the Bootstrap Bootcamp Home Study Course you will be guided through a 12-module intensive program that will equip you with essential knowledge, tools, and skills to succeed as a small farmer in the 21st-century. Building a Business Plan for your farm shouldn't be that hard! grow their farm business and profits to their full potential. "My partner and I learned more about the practical business of farming from your course than from a local business coach we hired". In a nutshell, the objective of this home study course is to guide you in creating a profitable, sustainable small farm business, while maintaining balance in your life. And, you can complete the Bootstrap Bootcamp at your own pace, and build a plan on your terms. If you've seen my farm website you know that I am a passionate believer in small, sustainable family farms feeding their local communities and in turn being supported by those communities. To support that model, I've written more than 300 pages of (free) content on my website. More than 6,000 people have downloaded my free web reports on farming and market gardening. Hundreds of people have bought my practical farming books ('Bootstrap Market Gardening', 'Pigs on Pasture', 'How to Raise Meat Chickens', 'Bootstrap Greenhouse') and from the feedback I've received, I know I've helped many of those people achieve their small farm goals. And for the last 18 years (in my 'other' life), I've consulted to farms, government departments, NGOs, and universities. I enjoy this work, but it has it's limits. What I needed was a way to reach more people. The solution: I've partnered with another local farmer to develop an intensive home study course for the new or serious 'wannabe' farmers - aka the Bootstrap Bootcamp. Jody MacIntosh of TOSH Gardens is a knowledgeable organic market gardener, and is well-known locally as a real entrepreneur. She brings a wealth of experience in starting-up, marketing and managing a small farm business. Jody took a different route to farming than I did, so you get the benefit of her experiences as well as mine. OK, I'm Interested, What Exactly Am I Getting? The Bootstrap Bootcamp home study course consists of 12 modules of practical information to give you the knowledge you need to start-up and manage your farm business. The material in this course has been selected by Jody and me based on 2 decades of research and consulting and more than a decade of practical experience in making a small farm 'work'. 5 teleconference training calls These calls were recorded during our last 'live' training, in which Jody and I discuss and explain module content and responded to participant questions. 5 custom-designed planning and calculating spreadsheets, to help you figure out pricing, income and expenses, and to plan garden production. The Bootstrap Bootcamp Business Plan Guide and Workbook, which pulls together all the information from the course and lets you build a practical business plan to guide your operations, or seek financing. Module 1: It's All About YOU. Your journey starts with where you are right now. This module sets the stage by asking you for some information about your expectations and your experience. Module 2: Your Vision. Dream big dreams; only big dreams have the power to move men's souls - Marcus Aurelius. This module presents a different approach to creating a BIG 'vision of success' for your farm. Module 3: Your Market. Nothing happens until somebody sells something – Peter Drucker . The Who, How, and Where of finding customers for your products. Module 4: Your Products. You need to define what you sell in terms that will appeal to your market. But you also need to go beyond that by conveying your principles, values and life roles in a Personal Mission Statement. Module 5: Your Pricing. One of the biggest challenges for the new entrepreneur is determining what to charge. This module will present a structured approach to setting prices for your products to remain competitive and assure a profit. Module 6: Your Finances. More small businesses run into problems due to inadequate cash flow than for any other reason. This module will explain the key financial analyses necessary to put your business on a sound footing. Module 7: Your Operations Pt 1. Now you have the plan and the customers. In this Module you figure out the What, How and How Much of growing to meet your market. Module 8: Your Operations Pt 2. The resources you will need to meet your production goals. Module 9: Your Customers. It's cheaper and easier to keep the customers you have happy, than to find new customers. This Module is all about making the sale, and customer care and communications. Module 10: Your Organization. Managing your team and your business. Here's what you need to know to stay on the right track. Module 11: Your Future. You are flush with success after Year One on your small farm. Here's how you go about growing your business into the future. Module 12: Your Practical Business Plan. Most conventional business plans aren't ideally suited for the small farm operator. In this module we show you how to put all your learning together, and create the Practical Business Plan for your business. OK, I Need This, What Will It Cost Me? The sixteen new and 'soon-to-be' farmers participated in our last Bootstrap Bootcamp 6-week Intensive Coaching Event, at a cost of $297. BUT, you can get the Bootstrap Bootcamp course materials and software as shown above, including the recorded conference calls featuring Jody and I and participants from the Live Coaching Event, to study on your own time, for just $47. That's a $250 saving! Special note abut the 5 audio recordings: these are live MP3 recordings of the actual training calls from our last coaching event, which attracted 16 participants. So the sound is NOT studio quality, but you should have no problem hearing the training and the Q&A from participants. How Important Is Your Dream to You? On a scale of 1 to 10, how important is your dream of a successful small farm? If you didn't say '9 or 10', then this intensive course probably won't help you. However, if you are very committed and willing to bring your brains and motivation to the task, Jody and I can help you realize your goals. Click on 'Add to Cart' to get started. YES! I'm a 10! I want to get started right away and learn how Start-up, Market and Manage my own successful small farm business. I understand that I will receive 12 Bootstrap Bootcamp course modules, including instructions and worksheets. I understand I will receive the 5 recorded teleconference training calls, and that I will receive 5 custom-designed spreadsheets to help plan and manage my farm business. I understand I will get all this by download link so I can start working on my farm plans right away! I want to save $250 and pay just $47 for the whole course, using my credit card or my PayPal balance (Note: a Paypal account is NOT NEEDED to get the Bootstrap Bootcamp INTENSIVE Home Study Course). Lets do it! p.s. Somebody once said '80% of success is showing up'. I agree, but knowing how is kind of important, too! Let us help you with that part, click on one of the 'Add to Cart' buttons to get started!